While you can get by with English in many parts of the world, this is not so much the case in South and Central America. Here it’s quite common even for waiters, vendors and even tourist guides to only know Spanish, which creates a greater language barrier for some travellers. This also means it can really pay off to learn some Spanish! But if just the thought of learning a new language makes you run for the hills, rest assured you won’t be completely lost without Spanish. You can still use hand gestures and other basic communication and get by. For example, one of my travel buddies spent a year travelling Latin America without knowing any Spanish at all. He managed just fine, though I did have to make fun of him a little sometimes. For a while, it seemed the only word he knew was “necessito” (meaning “I need”). He would say it followed by the English word for whatever he wanted. Necessito water! Necessito food! Necessito toilet paper! With some patience, you can make this work. Though rather than using my friend’s technique, you may want to use the phrase list or Google Translate. If you keep strictly to the backpacker hostel circuit, you will also be happy to know that most hostel staff is bilingual. That’s not an ideal way to travel around Latin America though. You’ll make it harder for yourself, not to mention miss many chances to interact with the locals. Even just having the ability to ask for directions, exchange pleasantries, or negotiate prices will be extremely valuable. 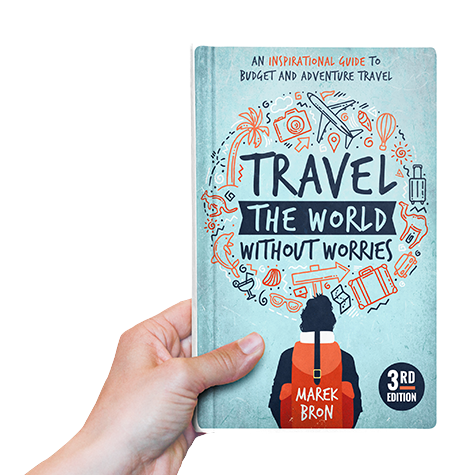 You will also be less seen as a typical gringo tourist which means fewer attempts to rip you off and a generally more helpful attitude. One audio course that tons of Latin America backpackers use is the Michel Thomas Method. Pretty much everyone on the trail seems to know about it. Using an audio course is ideal for learning Spanish during your downtime, either back home or during your trip. For instance, you can put some of those long bus journeys to good use. This is an excellent and cheap way to boost your vocabulary. I bought an old dictionary for a dollar in a hippie bookstore in Guatemala, and often spent 10 minutes every morning looking up words that might be useful and writing them down. Alternatively, get a dictionary or translator app on your phone. There’s many paid and free ones to choose from both on iOS and Android. There are even some free learning apps (or at least, they are free initially). One that I liked using was Babbel which teaches you the basics interactively (i.e. by matching words to pictures, putting words in the right order, and so on). Also check out this earlier post about language apps (and other useful travel apps). 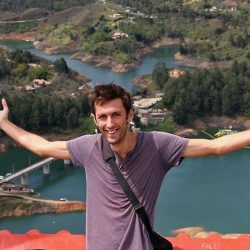 1-on-1 Spanish lessons are inexpensive in many Latin American countries with prices as low as $100 for a standard package of 20 hours (usually 4 hours a day over the course of 5 days, unless you go for something more customized). Guatemala is a popular country to take lessons: they are very affordable here and the Guatemalan dialect is very pure and easier to learn. In South America a lot of people take classes in Bolivia for similar reasons. You will however find Spanish schools pretty much anywhere along the Latin American gringo trail. 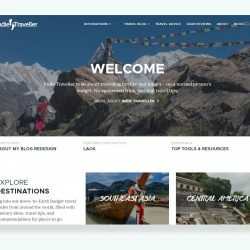 Though a lot of people will tell you that Bolivia is the cheapest and best country to learn Spanish in South America, while Guatemala is the cheapest and best coutnry to learn Spanish in Central America. Taking classes is really the best way to accelerate your language knowledge, as there’s nothing like a teacher giving you real-time feedback. 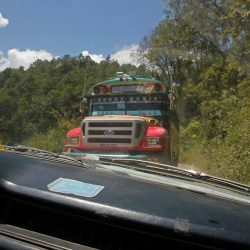 I took a week of classes near the start of my Latin America backpacking trip and was surprised by how much I learned in just that short amount of time. Often you can choose where to have your lessons. Some teachers will have interactive dialog sessions with you while walking around town, and others can come to your hostel for private teaching. A great way to learn the language is from people who speak it every day! Many courses actually offer you the opportunity to also stay in a homestay where you can practice Spanish in your daily interactions with your host family. 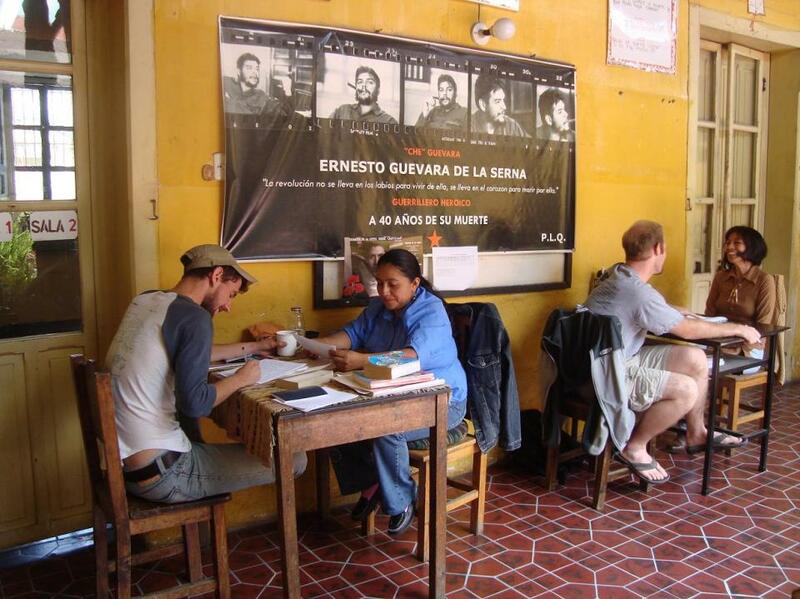 Volunteering during your trip is another way in which you can have regular interactions with Spanish-speaking locals. Another way is to simply not be shy and talk to locals whenever you can. Try to make some small talk with vendors for instance, or make friends with bilingual locals. Even if you stumble through your sentences, the effort is usually appreciated. Remember to ask people to correct you and your Spanish ability will probably make leaps and bounds. Bars or hostels will sometimes organize language exchanges, which you can find advertised on flyers and notice boards. This seemed to be very popular in Colombia for instance, and I have heard it’s common in Ecuador too. These language exchanges are often just an excuse for travellers and locals to mix and have a boozer, but many are also legitimately trying to improve. While it’s a little weird, try to get into a conversational mode where you only speak Spanish and the other person only speaks English, as this will benefit both parties the most. While learning a new language can be challenging, it can also be fun and it can enrich your travel experience. For long-term backpackers in Latin America, I particularly recommend making the investment. I took a bit of time early on my big Latin America trip to learn the language and it paid dividends the whole way through. 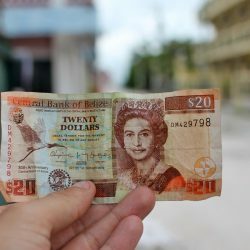 Hi, I know its an old post but for folks just arriving I found a couple of schools are no longer around and the price was excellent in Colombia. I had a look in Cali but no luck so ended up doing 4 weeks in Medellin at Total Spanish. It was really very good and I also fell in love with the city. Planning to study again in Mexico so if I do I’ll post back with my findings. 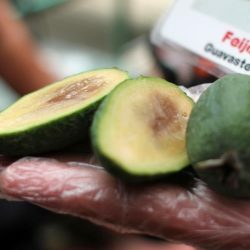 I’m probably going to base myself in Antigua, Guatamala, can anyone recommend a spanish school there? Whichever school your attend, I hope you enjoy your stay! Great post. I agree you can’t beat real world conversation with Spanish speakers as a learning tool. For apps/online option, duolingo is a great free option as well. Thank you for promoting the Spanish Language Learning. 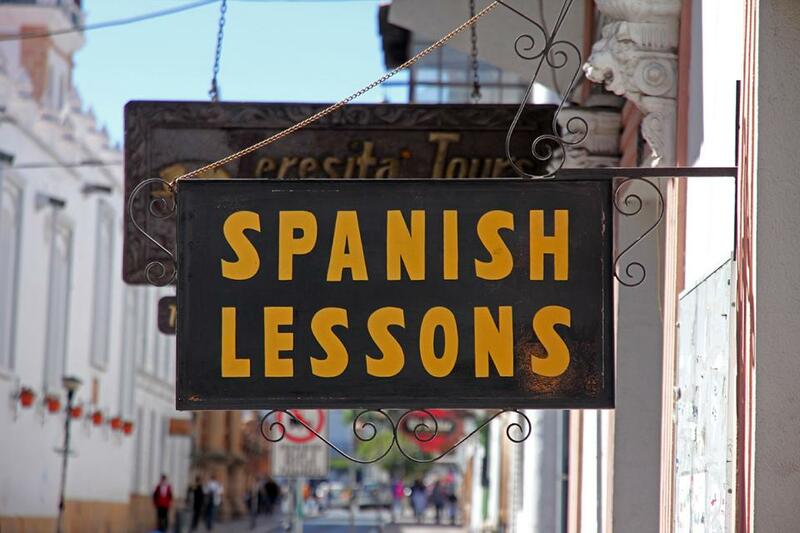 Getting private Spanish lessons is indeed cheap in South America. But prices can be very different from one country to another. For instance, the price for a week (7 days) at our language school in Granada, Nicaragua including 20 hours private lessons and homestay will cost you around a third of what a Spanish school with the same high standards will charge you in Costa Rica. Great post, great info, I’m 100% proficient in Spanish so I’m happy to know my life will be much easier and I might even get cheaper deals. As I start my dive career, I’m wishing I would have kept learning my languages. I know it’ll be easier to pick up once I start again, but I just need to do it! Thanks for the advice Marek! Great post. One of my favourite as I love learning foreign languages. I actually studied Spanish at the university for 3 years (basic level) so I would love to speak it once again when in Latin America. I would recommend Rosetta Stone programme to pick up some basics. I’m studying Dutch right now and this is a great help for me. Heard some great things about Rosetta Stone as it’s very interactive. Quite possibly a better option than audio lessons if you can afford it. Good luck learning Dutch (it’s very cool that you are!). It’s my mother tongue but I’m told it’s relatively difficult to learn as a foreigner.